Rising interest rates can mean a higher cost of debt for MLPs. Alerian MLP Infrastructure Index constituents are exposed primarily to fixed-rate debt, which should generally act more defensively against rising rates than floating- or variable-rate debt. Among AMZI constituents, about $40 billion of debt will likely need to be refinanced within the next five years, including $13.5 billion that will be due within the next three years. After spending some time on the fixed-income side of things, I know talking too much about debt can make people's eyes glaze over. But with interest rates rising, it's important to understand how MLPs might be affected. As we discussed in our recent white paper on interest rates and MLP performance, rising interest rates can be a headwind for MLPs in two ways: 1) bond investments become more attractive, which heightens competition for investor dollars among yield vehicles, and 2) borrowing costs rise. This piece focuses on the second impact through the analysis of MLP debt profiles, including a look at the composition of fixed- versus variable-/floating-rate debt and maturity structures. The aftermath of the Great Recession left a lot of headaches in its wake, and the dilemma of how the Fed should handle interest rates during the decade-plus recovery has been one of them. In response to the seriousness of the economic crisis, the Federal Reserve cut the federal funds rate to almost zero (0.00-0.25% to be precise) in December 2008. Interest rates hovered near zero from December 2008 until November 2015, but have since increased steadily to the current 2.25-2.5% benchmark rate. After raising interest rates four times in 2018, the Fed is now expected to raise interest rates twice in 2019. A recent "softening" of economic conditions and market volatility in the last few months has slowed the pace of interest rate hikes, but rising interest rates remain in focus nonetheless. Rising interest rates can have a significant impact on companies by raising the cost of debt. Companies are likely to pay higher interest expense due to increased rates on existing variable-rate debt and higher interest rates on any new debt issuances. In other words, the most impact will be felt by companies that have to frequently issue debt and by companies with existing debt structures with a high proportion of variable- and floating-rate issuances. MLPs have historically funded new projects and acquisitions with equal portions of debt and equity, but financing is evolving as many MLPs have moved towards self-funding the equity portion of their capital spending (read more). To be clear, MLPs are still reliant on debt for funding projects, and debt levels will continue to be closely monitored. As MLPs build new projects, they'll account for higher borrowing costs, but theoretically, internal rates of return (IRRs) should not be materially impacted because they can pass these costs on to customers. We researched the data from the quarterly reports of Alerian MLP Infrastructure Index (AMZI) constituents to determine their debt portfolios as of the third quarter of 2018. Specifically, we compiled the fixed-, floating-, and variable-rate debt from the supplemental notes in the companies' quarterly filings. For the purposes of this piece, we included all long-term debt and outstanding revolving credit facilities. 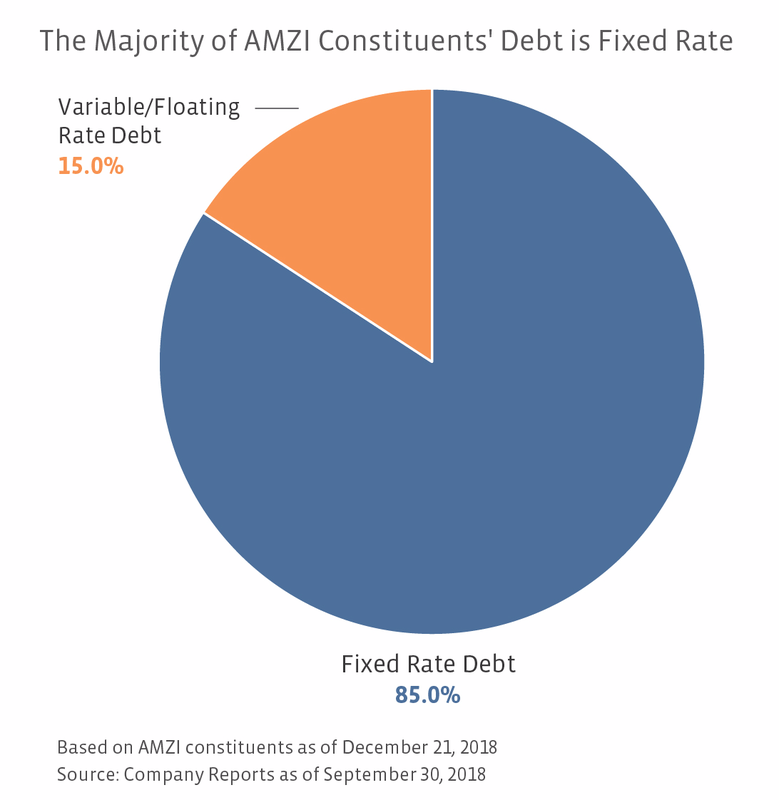 In aggregate, 85.0% of AMZI constituents' debt has a fixed interest rate, while 15.0% of constituents' debt has a variable or floating interest rate. Given the relatively high level of fixed debt in the sector, if interest rates continue to rise, the debt service cost for these constituents should remain relatively constant. In other words, the set payments from the fixed-rate securities will act defensively against higher rates. In contrast, the payments of variable- or floating-rate bonds are expected to go up if rates continue to increase. However, MLPs may use interest rate swaps to effectively convert variable-rate debt to fixed-rate debt and manage their exposure to rising interest rates. As a portion of their total financing mix, Holly Energy Partners (HEP) 64.8%, Antero Midstream (AM) 57.4%, NuStar Energy (NS) 53.4%, and Shell Midstream Partners (SHLX) 42.7% have the highest percentage of variable-/floating-rate debt among constituents of the AMZI. 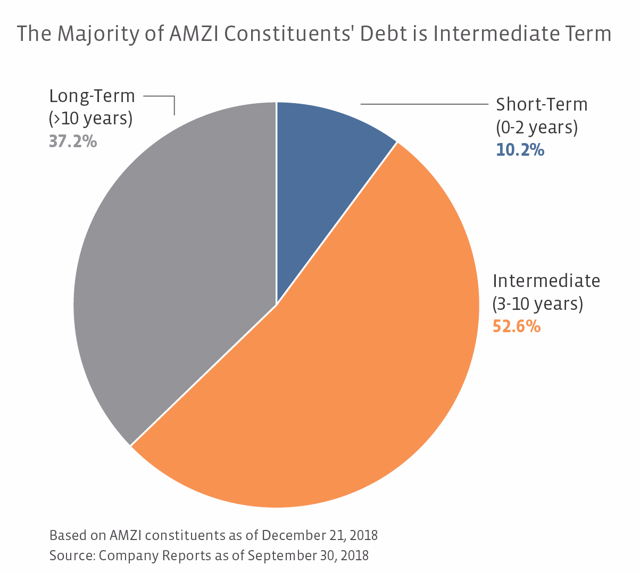 We also wanted to explore the maturities of AMZI constituents' debt to see how they might be impacted by increasing interest rates in both the short and long term. 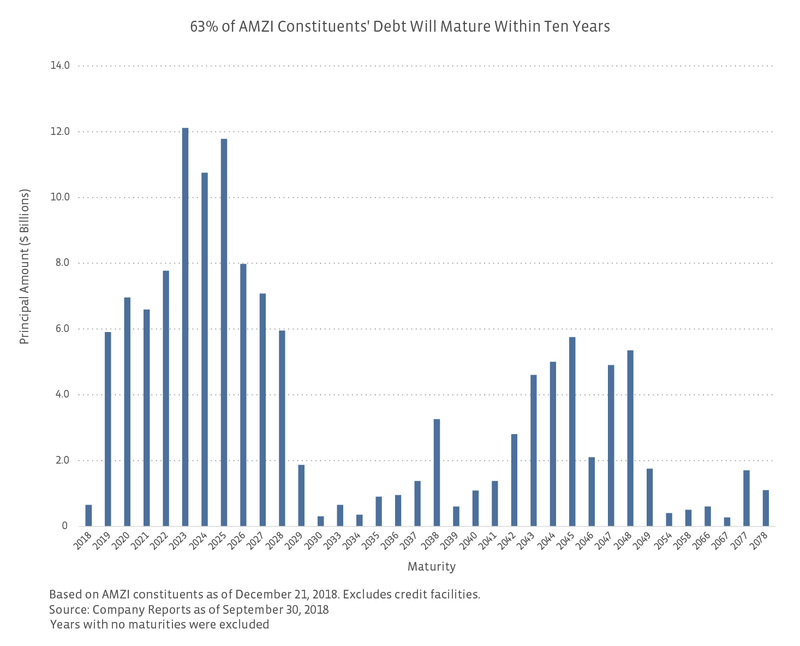 The pie chart below shows that MLPs in the AMZI have only a small percentage of debt - 10.2% - that qualifies as short-term (maturing in 0-2 years). The majority of debt (52.6%) is intermediate-term with maturities in the three- to ten-year time range, and a substantial portion (37.2%) is long-term and will mature in more than ten years. 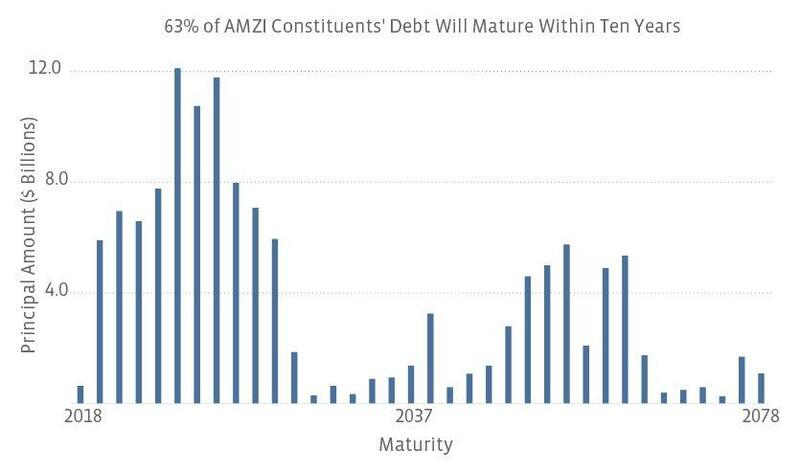 About $40 billion of debt will likely need to be refinanced within the next five years among AMZI constituents, including $13.5 billion that will be due within the next three years. The chart below shows AMZI constituents' debt maturities in more granular detail. While 63% of the debt will mature within a decade, there are several companies that have issued long-term debt dated past 30 years. In general, bonds with longer maturities are more sensitive to changes in interest rates, which is essentially a bond's duration1. Enterprise Products Partners (EPD) has the most (very) long-term debt outstanding, with $3.07 billion maturing between 2054 and 2078. Significantly, EPD has an issuer rating of BBB+ from S&P, which provides the company some flexibility to issue bonds with lengthy terms. Buckeye Partners (BPL), Energy Transfer (ET), and MPLX LP (MPLX) also have relatively small offerings that mature in 30 years or more. Notably, as of December 31, 74.7% of the AMZI Index by weighting had an investment grade credit rating. With interest rates gradually rising, companies with large amounts of debt generally will face higher borrowing costs. However, based on the debt profiles of AMZI constituents, MLPs are in a generally favorable position in the current environment given their high usage of fixed-rate debt with mostly medium- and long-term maturities. As a result, while interest rates are undoubtedly on the radar of MLP CFOs, rising rates are unlikely to be keeping them up at night for the next few years. 1 Duration is the sensitivity of a bond or other fixed income asset to changes in interest rates.